DU 4th cut-off 2018: Both SRCC and Satyawati College have released the fourth cut-off list for various undergraduate courses, today on July 5. DU 4th cut-off 2018: The fourth cut-off list for admission to various undergraduate (UG) courses (based on merit) for the Academic Year 2018-2019 has been released by the Delhi University (DU) today, on July 5. The online admission portal of the Delhi University, du.ac.in might work slow due to heavy traffic. Students and parents can check the list by the visited the preferred colleges. As many as 26,291 of 56,000 seats were filled in the second list, and many prominent colleges had closed admissions. However, 3,203 students withdrew their admissions. Other top colleges, however, have closed admissions to various courses. While Shri Ram College of Commerce closed admissions to its UG courses; Hindu is closed for history, political science, sociology and philosophy for the general category. Further, Ramjas closed admissions to its BCom Honours and Programme courses for the unreserved category. Admissions for BA Programme and Honours courses in economics, English, political science and mathematics at JMC are also closed. A statement issued by the Vivekananda College states, "All the candidates of 4th admission list shall be admitted from July 6 to July 9, 2018 between 9:30 am to 1:30 pm after verification of their documents. After approval of admission, students have to log in to the undergraduate admission portal to make online admission fee payment." 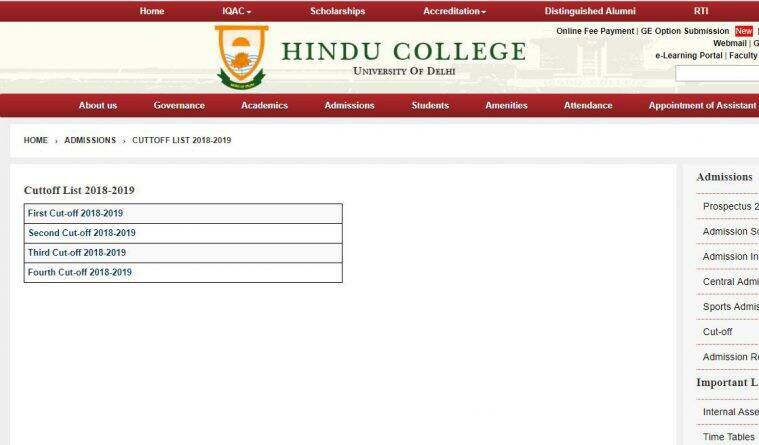 The Delhi University has also released the Non-Collegiate Women's Education Board (NCWEB) second cut-off list. Both Hansraj College and Miranda House have announced a cut-off of 84 and 83 per cent respectively for admission to BCom course. However, for their BA (Programme) in the general category, the admissions are closed. The Delhi University started its admission portal for aspirants of various undergraduate courses on May 15. The registration for these courses ended on June 7. The first cut-off list was announced on June 19. The total number of male applicants are 1,44,248, women 1,34,297 and other applicants 29. Unlike previous years, the Delhi University will release five cut-offs. The colleges will start classes from July 20 onwards and the final cut-off will release next week. At Ramjas College, there are seats available in the popular Economics (Hons) at 96.75 per cent while the cut-off has marginally dipped for English (Hons) which is at 95.25 per cent, History (Hons) at 94.75 per cent, Political Science (Hons) at 95.50 per cent. In LSR, only Philosophy (Hons), BA Programme and Statistics (Hons) were open and the college demand 92 per cent, 93.50 per cent and 97per cent, respectively. In Miranda House, the cut-off for Economics (Hons) was 96.75 per cent while for English (Hons), the cut-off remained same as the last list at 96.50 per cent. Those who wish admission in the Sociology (Hons) and BA Programme, the college demands 94.75 per cent and 94.75 per cent. While seats in various courses for general category is closed, the students belonging to the reserved categories still had a lot of coptions. It seems, seats will remain vacant for them in the fifth cut-off as well. For document verification and approval of admission, the students will have to visit morning colleges between 9.30 a.m. and 1.30 p.m.
With lots of students coming to Delhi for higher studies, the basis concern of the students and parents are accomodation facilities and foods. Keeping that in mind, lots of companies have opened luxurious PGs in Delhi which offered various types of foods, gym facilities, indoor games, like table tennis court, chess, billiards. These PGs costs from Rs 20,000 to 30,000 and are available mostly in the areas surrounding northern campus of Delhi University. The Delhi University's Non-Collegiate Women's Education Board (NCWEB), on Friday, announced its first cut-off list. The highest cut-off for admission in the general category to B.Com was 85 per cent for Hansraj College and Miranda House, a decline of five per cent from last year. For admission to BA programme, Hansraj College and Miranda House had announced a highest cut-off of 78 per cent, which had decreased by 10 per cent from last year. The admissions for NCWEB begon Saturday. The NCWEB is a non-formal system of obtaining degree from the Delhi University with lectures being delivered only on the weekends. Only women students residing in the National Capital Territory of Delhi can enrol themselves as students of the board. 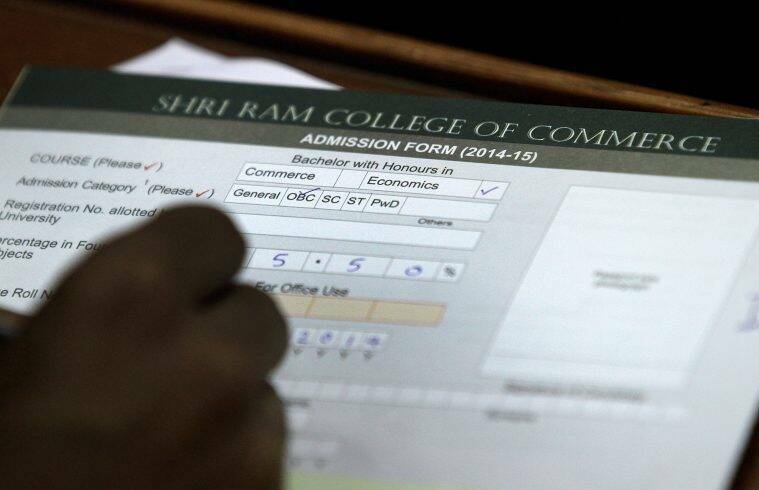 B.Com (Hons) is closed for the general category in Shaheed Bhagat Singh College, however, there are seats available for OBC (85.5 per cent), ST at 61 per cent and PwD for 50 per cent. Similarly, for B.Com, 94 per cent is required for general category while for reserved categories, it is closed. Most colleges have closed the admission for B.Com (Hons) programme. While Shri Ram College of Commerce closed admissions to its UG courses; Hindu is closed for history, political science, sociology and philosophy for the general category. Admissions for BA Programme and Honours courses in economics, English, political science and mathematics at JMC are also closed. For B.A (Hons) Hindi, the cut off for PwD category is 83 per cent. After the release of the fourth cut-off, OBC students possessing 91.75, SC/ST students possessing 91 per cent and PwD students holding 92 per cent can obtain admission for B.A (Hons) History. Cut-off for B.Com (Hons) for Kashmiri migrants is 87.375 per cent and that for B.A (Hons) Ecnomics is 92.75 per cent. Admission for B.Com has been closed by SRCC for general, OBC and SC candidates and for B.A (Hons) Ecnomics, it has been closed for general and SC candidates. For admission to B.Com and BA (Hons) Economics (first year)on the basis of avarage percentage in four best subject. Admission for the general category has now been closed for both these courses. For OBC category, the cut off for BA (Hons) Economics is 96 per cent. The cut-off for B.Com (Hons) for SC candidates is 90.50 per cent and for ST the cut off for BA (Hons) Economics is 90.75 per cent. For candidates belonging to PwD category, the cut off stands at 80 per cent and 88 per cent for B.Com and BA (Hons) Economics. Vivekananda College, Hindu College and Swami Shraddhanand College have also released their respective cut-off scores for admission into various undergraduate courses. As many as 26,291 of 56,000 seats were filled in the second list, and many prominent colleges had closed admissions. However, 3,203 students withdrew their admissions. The cut-off for admission in the University of Delhi is calculated on the basis of the ‘Best of Four’ formula wherein the average of the highest marks of any four subjects will be considered. The candidates who will meet the cut-off will be called for document verification and payment of admission fees into the respective college.